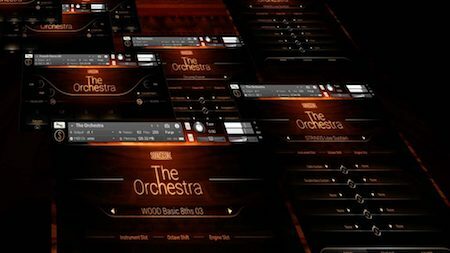 The Orchestra 1.1 is a revolutionary all-in-one 80 player orchestral library whose heart is our breakthrough Ensemble-Engine that empowers you to convert your ideas into music. Simple and incredibly fast. We found a way to revolutionise your way of composing complex orchestrated music. 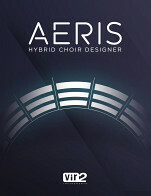 It's a new simplicity, a more natural approach to cope with multi-facetted orchestral colors and rhythms. Orchestral libraries have become more and more complex over the last years. 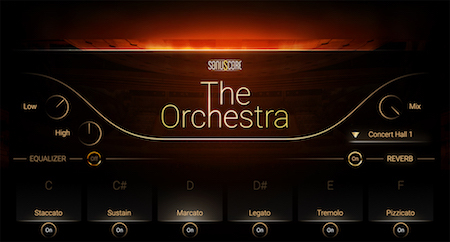 Developers captured every nuance of symphonic orchestras in countless different articulations. But with a tight deadline, having endless possibilities is not necessarily a good thing. 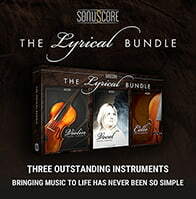 With this library, Sonuscore brings to life a simplistic approach to orchestral composition, giving you both innovative tools to create quick ensemble sketches with minimal effort or write complex orchestral arrangements in all detail. Paint your orchestral canvas in as broad or as detailed strokes as you want. Your ideas, your music – all in one instrument. The Ensemble Engine works through a number of independent arpeggiators and velocity envelopes, heavily inspired by our Sonuscore Origins-Series. Create pulsating rhythms and even inspiring full arrangements from any combination of notes. All of this without relying on prerecorded phrases – you have the full control. It will work, no matter what chord or note you play. With minimum loading times, a vast amount of presets provides you with full ensemble colors right out of the box. Independent arpeggiators and velocity envelopes create vivid and powerful orchestral colors. Load up to 5 different instruments in independent slots and play them together. Every slot can be assigned one of five different modules. Choose from 150 presets in three categories. 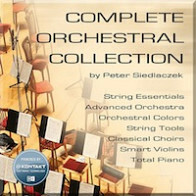 The Orchestral Colors presets are practical combinations of instruments that can be played live on your keyboard. 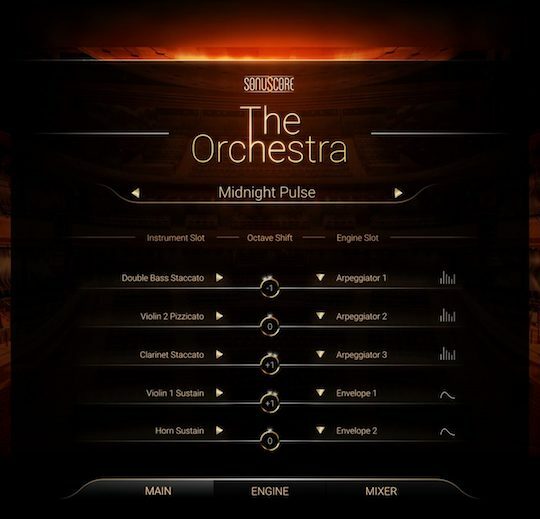 The Orchestral Rhythms contain simple, useful playable patterns for separate sections of the orchestra that make use of our Ensemble Engine. 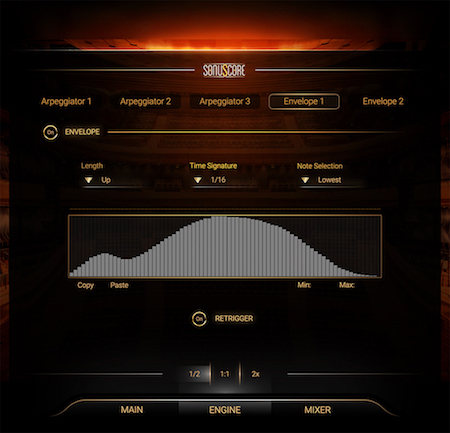 The animated orchestra presets go even further, and create complex orchestrated rhythms from any played note. This is where the magic happens! 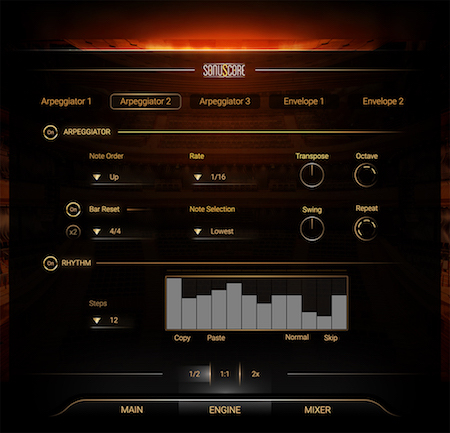 On the Engine page you can access all individual controls for each of the five instrument modules. Short notes can be arranged with the arpeggiators, while sustained notes can be shaped with the velocity envelope. Create the orchestral colors as you need them and let the magic happen. The arpeggiator creates fascinating melodic patterns to give your project a rich and lively orchestral feeling. Change the pattern of the arpeggiator with the rhythm stepper. If needed, you can modify almost every parameter to stay in full control of your orchestral color. The Velocity Envelope adds a recurring dynamic movement to a sustaining note. The centerpiece is the envelope shape, which can be drawn freely. Create full and detailed orchestrations from scratch. Play your ideas and your melodies freely with the single instrument patches. Aside from the Ensemble Instrument, THE ORCHESTRA also contains 88 single instrument patches for all standard sections and articulations in a symphonic orchestra, including percussion and as a bonus: choir. Multis take the Ensemble Engine even further toward instant playability and sound as they load and layer multiple instances of THE ORCHESTRA. 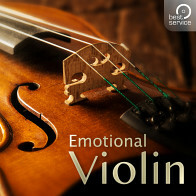 The easiest way to create complex orchestral arrangements. There are playable full orchestral multis for single articulations, that work perfectly for quick sketching and layering. Orchestral Rhythm and Animated Orchestra Multis combine multiple instances of the Ensemble Engine to create even more complex patterns. 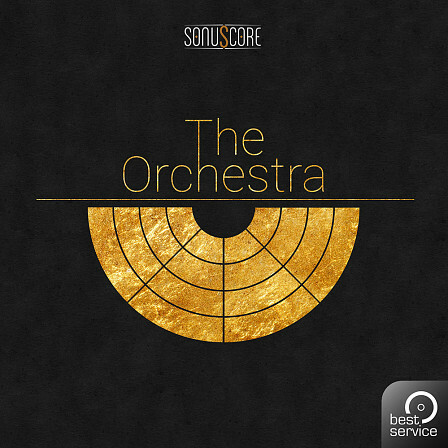 THE ORCHESTRA was recorded and processed with the intention to sound a bit rougher and more “honest” than the common orchestral Hollywood sound. It offers an alternative and promises straight and powerful sounds, punch and a vivid musical experience. The instruments for The Orchestra were recorded in Budapest at the renowned Studio 22 in their traditional seating position and mixed and edited with great attention to detail. This way the different sections blend together perfectly in the same room. All essential articulations are available, including playable true legato samples and multiple round robins for short articulations. The Following End User License Agreement is included with Orchestra, The. This License is only valid for the individual who has purchased an unopened, new and lawfully made copy of Orchestra, The from a dealer or distributor authorized by Big Fish Audio.